After our story about the chicken processor’s reliance on immigrant workers, Case Farms issued a statement. Here’s some context that’s missing. Earlier this week, we published a story in collaboration with The New Yorker about a poultry company named Case Farms, which government officials have called “outrageously dangerous,” and which has repeatedly used immigration status to get rid of workers who fought for higher pay or better conditions. In response, Case Farms issued a statement, which you can read here. Much of the statement is similar to what Case Farms officials told ProPublica during reporting and was included in the story. ProPublica first approached Case Farms in October and ultimately visited two of the company’s plants and interviewed executives over several hours in person and on the phone. Two New Yorker fact-checkers combed through the story and also spoke with Case Farms managers. Case Farms said it “has not terminated any workers, or injured workers, who protested vocally, or otherwise, for better pay, benefits or working conditions.” The National Labor Relations Board found that on three occasions Case Farms had unlawfully fired workers for complaining about working conditions or their union activity. You can read those decisions here and here. The company said that in 2016, its chicken catchers made on average $65,000 a year. 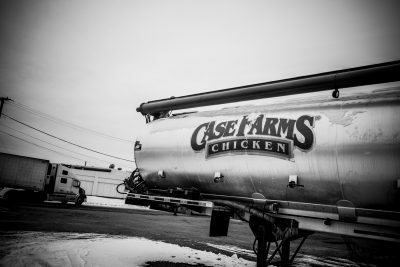 While Case Farms may employ some of its own catchers, the company’s statement leaves out the fact that it contracts out much of its chicken catching. Workers told us they are paid $2.25 for every 1,000 chickens and, as a crew, can catch about 75,000 chickens a night. If they catch that many every night, which is not guaranteed, they would earn more than $40,000 a year. Here is a letter from some chicken catchers to Case Farms and its contractor reflecting the piece-rate wage. Case Farms said that it’s “not affiliated” with Cal-Clean, the sanitation contractor that employed Osiel López Pérez, a teenager who lost a leg in one of the company’s machines. We noted that in the story but said the contractor was “closely affiliated” for several reasons: In its investigation into López’s accident, the federal Occupational Safety and Health Administration noted similarities between the two companies. Cal-Clean’s on-site supervisor had worked at Case Farms for more than 10 years, ultimately serving as sanitation manager before taking on the same role at the contractor. López didn’t recognize the name Cal-Clean when asked by a reporter and identified his employer as Case Farms. Emails obtained as part of the OSHA investigation show that Case Farms had the ability to terminate Cal-Clean employees from working at its plant. According to the investigation, Cal-Clean’s sanitation manual still had Case Farms’ name on it. Someone had simply added Cal-Clean’s logo to the bottom. Cal-Clean’s owner Steve Callaghan disputed a comment by Case Farms’ safety manager that the company had “nothing to do” with its procedures and told OSHA they shared responsibility. “We, Cal-Clean and Case, are in this together,” he said. “We, Cal-Clean and Case, are both going to get sued, and rightfully so. A young man lost his leg.” You can read a summary of OSHA’s investigation into Cal-Clean here. The agency’s inspection of Case Farms is not yet public because the poultry company is contesting the fines.